Since relocating to Singapore, I've been interviewed many times on a variety of subjects - from what life is like for a foreigner in Singapore to my experiences of being an expat blogger. The interviews have taken many forms - online video, newspaper and even a spot on local international TV in Shanghai. It's quite obvious to all my readers, that for the last month or so, I've been actively supporting the 'Gateway to Singapore' website (www.sg) which is run by MICA (Ministry of Information, Communication and the Arts). The desired effect of this support, was to create awareness for Singapore as a great place to live, work, study or play. A side effect has been a remarked increase in email soliciting detailed information on my experiences as an expat in Singapore and how and why I chose this country. So to make life a little easier, I will answer many of the questions by providing a transcript of a short interview I did last year for an online expat site. NB: The interview was conducted about 12-months ago, and much has happened since then (from receiving our PR - Permanent Resident status - to buying our car and HDB apartment), so I will edit the transcript to reflect our current situation. Also, the article links were written quite some time ago - you will find many more 'up to date' posts by searching this blog or using the menu items above. Disclaimer: These are my experiences only, and should not be regarded as the only authority for all expats or potential expats in Singapore. 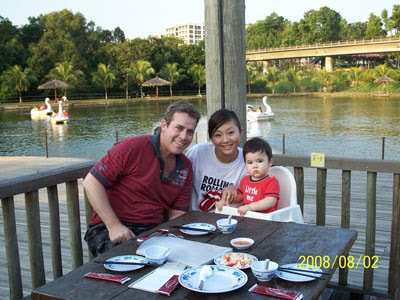 Australian expat Peter has been living and working in Singapore for the past three years, a country among whose advantages are its multiculturalism, affordable cost of living, and abundance of great food from various cultures. Here he shares how he came to be living in Singapore with his family, the diversity of languages spoken there, and what he thinks about the Singaporeans. -In which country and city are you living now? -Are you living alone or with your family? -How long have you been living in Singapore? -When did you come up with the idea of living in Singapore? We decided around mid-2006, after receiving and negotiating on an offer from a head-hunting company. After spending 17 years in another MNC, it was a life changing decision, supported by the salary and package on offer, along with the taxation benefits of Singapore as opposed to Australia. -Was it hard to get a visa or a working permit? Process for employment pass is very straightforward. Initial pass application was managed by a 3rd party assigned by my company. Renewal process was executed by me. Only downfall is the high volume of applications at MoM (Ministry of Manpower). Application must be lodged first, then must return to collect green cards and validated passports. We received our Permanent Resident (PR) status from Immigration in November, 2007, which took approximately 3-months to process. The advantage of being a PR, ranges from slightly better tax rates, CPF (pension fund) program, and the ability to buy a resale 'HDB' apartment (which foreigners on EPs cannot do). The only (perceived) disadvantage is that our son will be liable for NS (National Service) when he is a teenager. -Was it difficult for you to get medical insurance before you went there or when you first arrived? -How do you make your living in Singapore? Do you have any type of income generated? I am professionally employed by a large multinational company. I secured the employment contract, terms and conditions prior to departing Australia. I was offered this opportunity through an employment agency (head-hunting firm). -Do you speak the local language and do you think it's important to speak the local language? The most common language in Singapore is English, however many other languages are spoken – Hokkien, Mandarin, Malay, Tamil and others. Singapore locals (especially in the heartlands) have a very unique style of English, often referred to as 'Singlish', which is a combination of localized English with influence from other local languages. This can still be mostly understood by non-Singaporeans with time. I do have a basic knowledge and understanding of Mandarin, and my wife (born in Shanghai, China) speaks Mandarin and English fluently. Although many foreigners in Singapore may not appreciate it at first, once again especially in the 'heartlands' the Asian culture and Chinese influence is very strong. Therefore, to completely assimilate into society at a personal and local level, respect must always be shown to the local communities and people (this is especially true when it comes to the diversity of religion and beliefs in Singapore). -Do you miss home and family sometimes? I often miss family and friends, although we do have visitors from both of our families regularly (China and Australia). The Australian Network is readily available on television, so I am always able to enjoy my favourite pastime – watching AFL and NRL football. We love to swim and enjoy the sunshine, which is good given that it is always 'summer' in Singapore, with the weather being quite hot and humid. We also like to enjoy good food, and Singapore is well known for its diverse selection of cuisine, especially at local 'hawker' centres (food courts), where the widest variety of foods from various countries are available at very reasonable prices. It is common to eat out numerous times a week, due to the efficiency, value for money and great taste of the food on offer. -Do you have other plans for the future? I travel every other week throughout the region for business, but try and minimize this as much as possible since my baby has been born. This is another advantage of living in Singapore, as it is quite 'central' to all the other countries in the Asia Pacific region. -What about housing, have you bought, or are you renting a home? How much do you pay for it? We rented for more than two and a half years. We have seen the cost of rentals rise in Singapore dramatically over the last couple of years, but are of the understanding that the market is now stabilizing. The closer one lives to the central 'city' district, the more (exponentially) expensive it becomes. We were at the northern tip of Singapore near the causeway to Malaysia, at Woodlands. A condominium style apartment there in the heartlands, may cost anywhere between S$2500 to S$3500 (at current prices) per month – for a three bedroom, around 1200 square feet. A HDB apartment will be substantially less, but does not offer the same level of security or facilities (pool, gymnasium, etc). In October, 2009 we moved into our very own HDB apartment... how much better it is to invest in oursleves rather than lining our landlord's pockets!! -What is the cost of living in Singapore? Apart from the quite high cost of (rental) accommodation, and motor vehicles (one must purchase a COE - certificate of entitlement - to drive a car in Singapore), most other daily necessities are quite affordable in relation to wages and in comparison to most other countries in Asia (notwithstanding most parts of China and India). -What do you think about the Singaporeans? In general, Singaporeans are quite caring and accepting people. Due to the fact that the economy is very much based around service and financial industries, they take education very, very seriously, which I think might put some pressure on the children, and may cause some stress. Singapore is a very multicultural, multi-religious society, so tolerance is very important. If one reads some of the local online forums, there might sometimes seem to be a perceived element of distrust in foreigners residing in Singapore, but this really is the minority and should not dissuade anyone from relocating to the Republic. As is the case in many countries, if respect is offered, respect will be returned. -Do you have any favorite Web sites or blogs about Singapore? Hi there Cecilia - best of luck to you and your husband on your potential move!! Please be sure to reach out to me if you need some further advice or information not found here... you can get to my email address via the "About" link at the bottom right of this blog.